Kyoto is located in central Japan with nearly 1,5 million inhabitants. It used to be the imperial capital of Japan, until it changed to Tokyo in 1868. The city is one of the few with an ancient city centre. The Imperial City of Kyoto still has prewar buildings like traditional townhouses. This is in constrast with the many modernisation projects that are under construction. Kyoto is located on top of a large natural water buffer. This provides the city of its water needs. Under pressure of the growing urbanisation the rain infiltration rates are decreasing whilst the water demand is increasing. This faces the city with new problems for which a solution isn’t found yet. The city is considered to be the cultural capital of Japan. Because it was the actual capital before Tokyo and because many buildings are still intact there is a lot that can be seen of ancient days. Kyoto is connected to Tokyo with the high speed bullet trains (Shinkansen). The 515 km take just under two and a half hours. But this isn’t the only impressive transport system they develpoed. 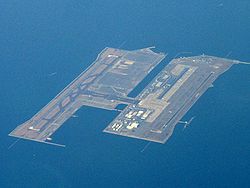 The Kansai International Airport is built upon man made land built in 1994. Eventhough the Dutch are famous for their land reclamation, the Japanese have managed to build an entire airport in what used to be sea. A sea that is under constant treath of typhoons and earthquakes. It is awarded one of the ten “Civil Engineering Monument of the Millenium” awards.